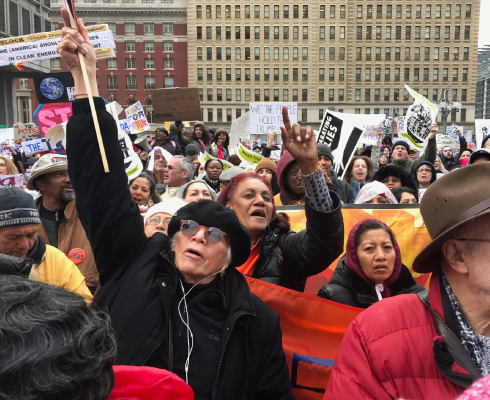 Center for Popular Democracy and fellow members of Communities United for Police Reform are celebrating this morning following the New York City Council’s historic vote to enact bold measures to address stop and frisk and other discriminatory NYPD strategies. The passage of the Community Safety Act, vetoed by Mayor Bloomberg earlier this summer, is a victory for City residents and advocates who have fought for years to bring an end to practices that have unjustly targeted their communities. The laws that have been put into place today stand as models for efforts to combat discriminatory policing that are underway or emerging in states and cities nationwide. One of the first steps CPD took upon our founding in 2012 was to join CPR, a coalition of base-building, legal and policy organizations committed to challenging discriminatory NYPD policies targeting New Yorkers of color, immigrants, LGBTQ individuals, homeless residents and youth. In the year since, CPD has worked closely with CPR, providing legal, policy and communications support for its work. The campaign has succeeded in making “stop and frisk” perhaps the most widely discussed policy issue of the year, triggering debates both within City Hall and in households and workplaces across the five boroughs and beyond. And in a groundbreaking effort, the coalition secured passage of two measures—Intro 1080, the End NYPD Discriminatory Profiling Bill, and Intro 1079, the NYPD Oversight Act—in the New York City Council in June. The two bills, part of a package called the Community Safety Act developed by CPR member groups and their allies in the Council, expand and strengthen the City’s prohibition of police profiling and establish an Inspector General with the power to oversee the Department’s policies and operations. Soon after the bills’ passage, however, Mayor Bloomberg vetoed the measures and began deploying the full set of resources at his disposal to erode support. The Council’s vote to override last night to override Mayor Bloomberg’s veto signaled definitively that New York is moving toward a smarter, more effective and more just approach to policing. Following soon after Judge Shira A. Scheindlin’s recent opinion in Floyd v. City of New York, which declared the NYPD’s “stop and frisk” practices to be unconstitutional and ordered the Department to institute significant reforms, the override vote reflects an important historical moment that community organizers and policy advocates have been working towards for many years. It signals that tactics that confuse policing with prejudice will not be tolerated. In voting for police accountability, the City Council has challenged the NYPD to live up to its reputation as the most sophisticated police force in the nation by finding a way to guarantee safety for all New Yorkers without sacrificing civil rights. CPD is thrilled to celebrate this victory alongside our many partners in CPR and Council Members Jumaane Williams and Brad Lander, key sponsors of the legislation. We look forward to continuing the fight for just policing in New York and beyond.